I realize that this is a little later than I usually have the author interviews, but I am still trying to figure this whole thing out. Lucky for me I have worked with some awesome, understanding, and pleasant authors. Another thank you to Andrew Rowe for allowing me to pick his brain! You can find my review of his novel HERE. As a role-playing game designer, I’ve worked on a variety of different settings over the years. The world that Forging Divinity takes place in was developed for one of my pen and paper role-playing game campaigns, and I’ve built on it gradually over the course of many years. This specific story started off in a somewhat strange place – I wanted to write a fantasy novel with a hero confronting progressively stronger opposition, similar to a shonen anime or Scott Pilgrim vs. The World. Throughout the process of writing it, the story shifted significantly, although Taelien’s chapters retain some of the combat-focused design from the original concept. The names of your character are so unique. How did you find names for them? What author/authors inspire your writing? The most obvious is Brandon Sanderson, since he’s popularized the idea of magical systems that have clear rules and limitations. I’ve always enjoyed similar systems and seeing Brandon’s success helped me realize that writing one within a novel was a viable option. I thoroughly enjoy the complex and morally gray characters in George R.R. Martin’s works, as well as authors like Joe Abercrombie and Django Wexler. Patrick Rothfuss and Scott Lynch inspire a lot of my interest in more roguish characters, and I’d say that they had some degree of influence on how I write Jonan’s chapters. Finally, Will Wight is fantastic at combat scenes and his writing (as well as Sanderson’s) helped influence how I depict combat. How do you deal with writers block or lack of inspiration? That’s a tough one. I try to set aside a block of time every week to write – typically Sunday – and work on something even if I’m not exactly in the mood. If I can’t find the inspiration to write prose, I’ll try to do something related, like working on an outline, research, or rereading my earlier chapters. I also often listen to music for inspiration. In particular, I enjoy listening to remixes of older game music and anime themes. What made you decide to self-publish as opposed to traditional publishing? First, I wanted to ensure that I had complete control over my intellectual property. I also wanted to have the opportunity to prove the viability of my work without an outside publisher pushing it from a marketing standpoint. If I can show that I can sell thousands of copies on my own, theoretically it should make my book more likely to be picked up for a better deal if I decide I want to go to a publisher directly in the future. I also retain more creative control over other elements, such as the cover. I was able to approach the artist I wanted directly, and as a result I believe I found the best artist possible for matching the style that I wanted. Finally, I retain a much larger percentage of book profits this way, so if the book ends up being a huge success I’ll be able to retain a significant percentage of the net gains. Would you ever want to be published traditionally? I’d definitely consider it, but it would depend on the terms of the deal. It’d be nice to get copies directly into bookstores, and extra marketing would be useful, but self-publishing definitely has advantages. When did you start writing? What sparked your interest? I’ve been writing little things here and there since childhood. As a kid, my heroes were always adventurers – often the green tunic wearing ones, like Peter Pan, Robin Hood, and Link. I remember writing my first little stories about characters of my own creation during elementary school, right around the time I started reading Dragons of Autumn Twilight, the first book in the Dragonlance series. I was already playing Dungeons and Dragons at that point, both in pen and paper and CRPG formats – Pool of Radiance was one of my first PC games. I think Dragonlance and D&D had a huge influence on my early life and my interest in writing. Would or have you considered venturing into other genres? Absolutely. One of my earlier attempts at a novel was a comedic deconstruction of the traditional fantasy assassin novel, for example. I’ve also been strongly considering writing a “trapped in a MMORPG” style book, given that I’ve worked on MMORPGs for many years and how much interest there is in that genre with anime, manga, and novels like Log Horizon, Sword Art Online, Overlord, etc. What is your favorite genre when reading? Fantasy with well-defined magic systems. Do you have a favorite author? Probably Brandon Sanderson at the moment. I also really enjoy Jim Butcher and Steven Brust’s works. Where do you find it easiest to write? Your favorite spot to shut out the world and step into your stories. I write in my bedroom with all the doors closed. I often have some music playing – but nothing too distracting. Do you have a dream office/ writing spot? If you could co-write with any famous author, who would you pick? That’s a really tough one. Sanderson would be the most logical choice and he’d be a good pick. I’d also strongly consider Jim Butcher – he’s a fantastic writer and I think he’d be a ton of fun to work with. Where do you want your writing career to go? I’d love to build my world into a franchise. Since I work at one of the best RPG developers in the world, it would be my dream to eventually get Obsidian to make a game in my setting. Eventually, I’d like to be writing closer to full time, although I enjoy working on game design as well. Moving into doing more narrative design work for Obsidian could also be a lot of fun. When can we expect another novel from you? I am anxiously waiting. I’m expecting to release the sequel to Forging Divinity, which is tentatively titled Stealing Sorcery, sometime in the winter of this year or early next year. Your cover art is beautiful. Could you briefly describe the process of finding the right artist and concept for the cover? Thank you! Initially, I went through books in Barnes and Noble looking for the artists I liked and looking them up online. Once I had found a bunch of them, I also looked for related or similar artists on DeviantArt and similar sites. Eventually, I stumbled upon the work of Daniel Kamarudin on DeviantArt and I absolutely loved it. I contacted him to see if he was taking commissions and we negotiated out all the details. It was a fantastic experience, and I’m proud to say that I’m working with him again for the second book. What other hobbies and interest take up your time when you are not writing? I work in the computer gaming industry, so that takes up a ton of my time, and I also play a lot of computer and video games for fun. Aside from that, I also enjoy tabletop gaming and live-action role-playing. I also watch a ton of anime, read a few manga and manhwa here and there, and read a ton of books. If you could bring one of your characters to reality, who would it be and why? Probably one of my gods (which one I’d pick would probably be a spoiler), so I could convince him or her to give me super powers. I’m an optimizer – I’d have to pick whatever would get the best results. What is the one thing you wish you had known before you started writing? Great question. I’d say that it’s probably that weaknesses and limitations – in characters, magic systems, or items – can be as or more important than strengths. As a young writer, I just wanted to make everything as powerful and awesome as I could imagine. As I’ve gained experience, I’ve found that writing an underdog character or an item with limitations can make them vastly more interesting, in my opinion. Challenges build character. Lastly, where you can your readers find you on the internet? You can find my blog at https://andrewkrowe.wordpress.com/. 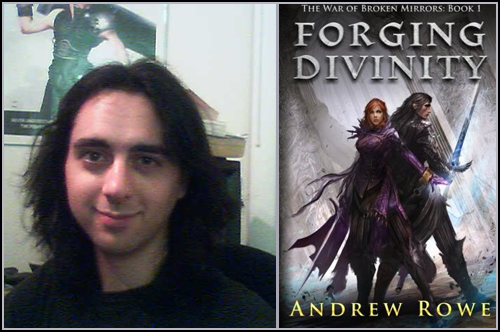 I also have a Forging Divinity Facebook page and you can find me on Twitter here. If you know of any self-published or even small press authors that would be willing to speak with me, send them my way! If you are a self-published/small press author head on over to my contact page and send me an e-mail. Maybe you can be my next featured author!